By the way, don't be fooled by "the silence." Lots happening, just not on the front pages or on the blogs yet. Just like when you have a house filled with children, it's not the yelling that worries you, it's the silence. Stay tuned. The Rev Mary Glasspool will become Assistant Bishop of Los Angeles in a “grand event” taking place at a 13,500-seat arena on the Californian coast. Her appointment is being made despite warnings from the Archbishop of Canterbury, Dr Rowan Williams, about the “serious questions” it will raise for the 80 million-strong Anglican Communion. It is being viewed by traditionalists as another “provocative” move by the ultra-liberal Episcopal Church of the USA in “defiance” of pleas not to go against tradition and Scripture by ordaining homosexual bishops. The Communion was first driven to the brink of schism over sexuality in 2003 when the Episcopal Church, the official Anglican province of the USA, consecrated the first openly homosexual bishop, the Rt Rev Gene Robinson. Since then hundreds of orthodox American clergy and congregations have joined other provinces or formed breakaway movements, triggering bitter legal battles over the ownership of church property. There have been repeated official calls for both sides to desist from further actions that would worsen the divide, but last year the Episcopal Church vowed to continue ordaining homosexual clergy despite a personal plea from the Archbishop of Canterbury. Dr Williams said last year that the proposed consecration of Miss Glasspool “raises very serious questions not just for the Episcopal Church and its place in the Anglican Communion but for the Communion as a whole”. 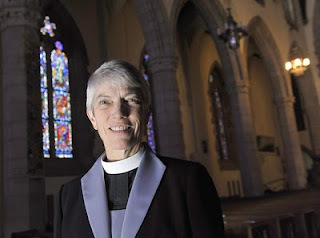 However she will be made an Assistant Bishop on Saturday afternoon at the Long Beach Arena, by the Most Rev Katharine Jefferts Schori, Presiding Bishop of the Episcopal Church. The “grand event in the life of the Diocese of Los Angeles” will feature “music and dance highlighting the cultural diversity of our diocesan community” while lay guests have been told to wear “Sunday Best / festive native dress”. Miss Glasspool, formerly a Canon in the Diocese of Maryland who has been with her female partner since 1988, will become the first woman bishop in Los Angeles along with the Rev Diane Bruce. They said the “provocative step” shows a “deliberate disregard” for rest of the Anglican Communion and constitutes a “clear rejection” of calls for restraint made by official bodies in recent years. A communiqué issued by the Global South – Anglican provinces in the developing world – has called on the Episcopal Church to express “genuine repentance” for its “defiance” in the consecration. 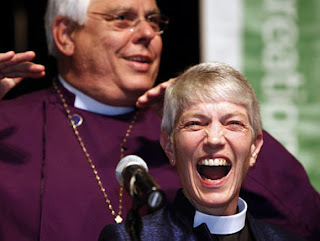 The Episcopal Church in the US is set to go ahead with the controversial ordination of an openly lesbian bishop. Saturday's ordination comes despite warnings from the Archbishop of Canterbury that it will deepen an already bitter dispute on sexuality. Canon Mary Glasspool, 56, will become an assistant bishop in Los Angeles, the first openly gay US bishop since Gene Robinson seven years ago. Since then the Anglican Communion has been on course for a permanent split. The election of Mary Glasspool - who has been with her partner Becki for 22 years - represented a snub by the liberal Episcopal Church to other Anglican Churches around the world. Archbishop of Canterbury Rowan Williams had urged the American Church not to proceed with the ordination, warning that it would further alienate traditionalists who believe active homosexuality to be a sin. It is likely to accelerate the gradual marginalisation of the Episcopal Church within a two-tier Communion and increase tensions between Anglicans elsewhere. The Communion has never recovered from the crisis prompted by the election in New Hampshire of Gene Robinson as its first openly gay bishop in November 2003. The Episcopal Church at first agreed to suspend the creation of gay bishops but reversed that decision last July. My predictions for today are that the Sun will rise and set and there will be no formal split in the so-called Anglican Communion. The Continuing Episcopalians will get their knickers in a knot and not a damned thing will change. I am afraid that you are far too correct about all of that. Wow. You're all finally catchin' on. Other things will not change as well. The Episcopal Church will continue its precipitous demographic decline and parishes will close across the country. It will become an even more urban, liberal, progressive niche market being blown about by whatever trendy thing happens to blow out of academia. In the end, they will remain irrelevant. Even by progressive terms, they are behind the times. "A communiqué issued by the Global South – Anglican provinces in the developing world – has called on the Episcopal Church to express “genuine repentance” for its “defiance” in the consecration." Don't hold your breath, Global South. "Our correspondent says the latest ordination is likely to accelerate the gradual marginalisation of the Episcopal Church within a two-tier Communion and increase tensions between Anglicans elsewhere." Note the term "gradual marginalisation." Wonder how long it will actually take - how many years will Anglicans put up with this part of the "Anglican Communion"
Actually, Anglicanism has always been a schism within the catholic church. You must remember that it is a church founded because a king wanted a divorce. And the Roman Catholic Church, from which the Anglicans parted company, was itself a schism from what was then the Christian Church, now called the Eastern Orthodox. Perhaps it is getting to be time to, like the prodigal son, begin thinking about returning home. You already love to use the term "orthodox." Why don't you just commit wholeheartedly and go there? "The Anglican Communion is very large Communion – one of the largest of the world churches, second only to the Roman Catholic Church in numbers. What goes on in our Communion is being watched closely by leaders in other denominations which have similar problems, albeit in less advanced turbulence. How our Communion comes through this crisis will have an enormous impact on Christianity in the world at large." Based on the numbers of adherents, Orthodoxy is the second largest Christian communion in the world after the Roman Catholic Church. The most common estimates of the number of Orthodox Christians worldwide is approximately 300 million . With approximately 70–80 million members, the Anglican Communion is the third largest Christian communion in the world, after the Roman Catholic Church and the Eastern Orthodox Churches. watch the ABC try to get another 7 years of delaying any action against revisionists' unilateral actions....... watch the GS (50m Anglicans) move on.....they have work to do.....too much time wastd with tiny, declining groups of revisionsts. Big Bad John on her coat tails, but his sermon fell flat! TEC journey into darkness, contraposed to God’s plan. Barbie Harris?! Get real. Bonnie & Fred in this crime? Give up, you old fogies, you’re all way past your prime! If anything’s left of litigious “LBGT agenda’s” superficial success. You won’t have my support! There’s one less you’ll lead astray! You could use more pizzazz; abortive faith you begat! But it’s you who will end up in Gehenna’s trash dung! And you are right about the numbers - the statement about numbers talks about "churches" - "Orthodox Christians" aren't counted together in such numbers, since they belong to a number of different world bodies, unlike the Anglican Communion. However, to be fair, the word used is "churches" - for simplicity's sake, so we don't have to describe exactly what a "Communion" is - but many will say, the Anglican Communion is not itself a church, but a union of churches. So if we're strict, even though the Anglican Communion is a large worldwide body, it isn't a church, so it also doesn't deserve to be listed as "number two." This was not posted to laud the Communion in any way, or to show up other churches. Rather, it was posted to show other Christians, like yourself, the depth of this crisis. Since the Anglican Communion is so large - it is a terrible crisis for all of Christianity, and what we are doing to the body of Christ is indeed reprehensible. I encourage some to consider the Orthodox Church. I don't wish you to encourage anyone to join an Anglican congregation - but please think and pray about what you can do to help minimize the scope of the damage. I'd suggest that one thing you can do is help faithful Anglicans who are willing to look these problems in the face, name them for what they are, and address them in love and truth. You may well find congregations like this which you can help in collaborative ministry. that the Episcopal Church is determined to have their way in this matter over objections in the Anglican Church outside the USA.